Olympia—Over 30,000 of last year’s eighth graders signed up for the College Bound Scholarship. The scholarship helps Washington’s low-income students reach higher levels of educational attainment. In combination with other state aid, it covers tuition at public college rates. Eligible students sign up in middle school by June 30 of their eighth grade year to receive an early commitment of state funding. 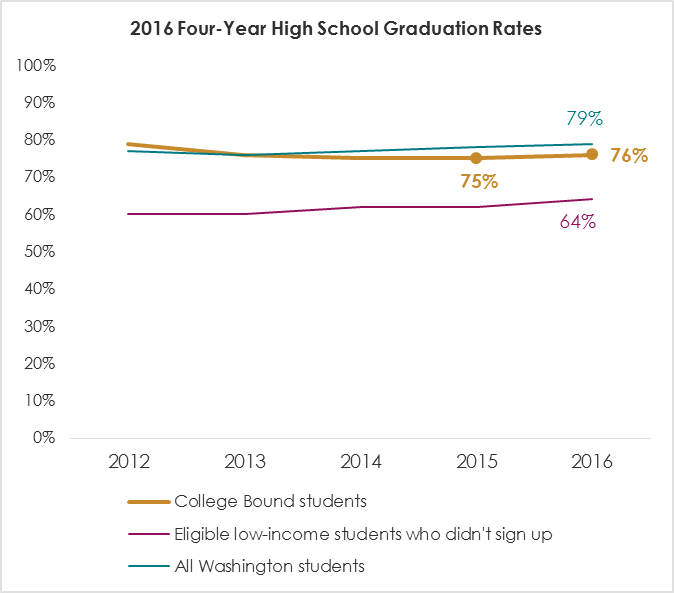 Even with more students signing up for the program, College Bound high school graduation rates have held steady. For the last five years, they’ve been more than 10 percentage points above the statewide average for low-income students who did not sign up for the program. The 2016 four-year high school graduation rate for College Bound Scholarship students was 76 percent. In comparison, only 64 percent of low-income students who were eligible—but didn’t sign up—graduated in 2016. The benefits of the College Bound Scholarship program extend beyond high school. College Bound students are enrolling in college at slightly higher than the statewide rate. To receive the scholarship, students must be admitted to and enroll in an eligible college within one year of high school graduation. In 2013-14, College Bound students enrolled in college at a rate of 64 percent. This is three percentage points higher than the statewide college enrollment rate of 61 percent. As the College Bound Scholarship has grown, the importance of middle school sign-up efforts is clear. To highlight the role of school districts—and especially middle schools—Governor Inslee has recognized over 200 schools and 103 school districts with Gold Star Awards. These schools and districts exceeded the statewide average sign-up rate of 71 percent. School district sign-up rates are available on the WSAC website.